Real 2" Stickers Designed By Kangaroo Artists; High Quality That Really Stick! Unique Designs. And They Tear With Easy Perforation Unlike Those Stickers Where You Rip And End Up Ripping Stickers. This Is An Assortment Of The Best Of The Different Sticker Themes Kangaroo Offers. Comes in A Beautiful Open Box, Gift Box. Great For School, Arts & Crafts Projects, Sticker Collecting, Birthday Party Favors & Birthdays. Kangaroo Stickers In This Set Will Not Be Found In Any Other Sticker Assortment By Any Other Company In The World. All Stickers Designed By In House Kangaroo Artists. All Themes In This Sticker Assortment Can Be Purchased Solo On Amazon in 500 Lots, Except Emoji Which Comes in a 1,000 Lot Like This. For Example If You Really Loved Our Aquamarine Sea Life Or Were Having A Sea Life Themed Party, You Can Buy 500 Of Just Sea Life Stickers. If Your A Teacher And You Love Our Stars, You Can Buy Stars Exclusively- All Available On Amazon! Great for my in home daycare! I have 4 children of my own and own an in home daycare. I used to have a chart on the wall for good behavior but I didn't feel as it was incorporating the children enough in them feeling rewarded for good behavior. So I decided from now on to give each child that was good for that day a sticker to wear home. This shows the parents that they had a good day and also leaves them feeling rewarded and having something to show for it. This box comes with 1000 stickers. 10 rolls of 100 stickers. Well worth it for the price. Each sticker comes perforated for easy tearing from the roll and sticks to and removes from children's clothes without problems. Each sticker is differently themed. The themes are: Under the sea, Dinosaurs, emoji's, insects, safari, birthday/party, different colored smiley faces, stars & cats and dogs. 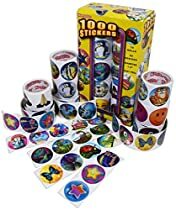 Overall great box of stickers to have on hand and would be great for a daycare, doctors office, carnival prize or other kid friendly environment. I received these stickers at a discount but it was NOT in exchange for my review. What a great assortment of stickers! I love stickers and I like keeping them around for my grand children, nieces, and nephews. They are always so happy to get new stickers. These are all round and the same size and they are on reels. They stick very well and we were even able to restick them a few times. I especially love all of the different the emoji ones because that's a very popular thing going around. The kids think the faces are funny and they love putting the stickers on themselves and on me. I also use the stickers to decorate cards and letters because it adds a special touch. The stickers are all so vibrant and pretty. I plan on getting a set and giving them to a few teachers because I know they can use them as rewards in their classrooms! They've also included dinosaurs, bugs & insects, cats & dogs, ocean creatures, & some Happy Birthday stickers and they are all great! I received these at a discount or a sample was provided to me for testing and reviewing purposes. The kangaroo stickers came in a yellow box with a lot of the designs that are on the sticker themselves. It came with 10 individual rolls that are wrapped in clear plastic and there is a red sticker arrow that can be used on the stickers so it does not unravel. There are 60 designs and they are 1.5 inch diameter diameter. Each roll has its own sticker design. Some designs are: emoji icons, under the sea animals, starts, animals, regular smiley faces with different colors, bugs and cupcakes. The stickers are on a white paper which can be ripped separately so I can be given out as party favors or keep the roll clean by taking out the white paper. The stickers are easy to peel off and my kids enjoy playing with some of them. I received this product for free or at a discounted price in exchange for an honest and unbiased review. I do not receive any monetary compensation to review this item and this is my honest and unbiased opinion.